Tori Schickel takes a shot during Butler’s win over Kent State on March 23 in the second round of the WNIT. The Bulldogs will play at Cincinnati in the third round on March 28. Jimmy Lafakis/Collegian file photo. Following a 2-1 series win against Valparaiso, the Butler baseball team will travel to Highland Heights, Kentucky, to take on Northern Kentucky Tuesday afternoon. It’s the first of two games between the teams, as the Norse will play Butler at Bulldog Park on April 23. Last year, both of the scheduled games between the two teams were canceled due to rain. Northern Kentucky is 4-16 on the season after being swept by Milwaukee in a three-game series over the weekend. First pitch from the Bill Aker Baseball Complex is scheduled for 3 p.m. The Butler softball team began conference play this past weekend with a 1-2 series against DePaul which moved them to 10-19 on the season. Before the Bulldogs’ next Big East contest this upcoming weekend, they’ll play two nonconference opponents, starting with Evansville on Tuesday afternoon. The Purple Aces are 12-16 on the season following a 2-1 series win against Loyola this past weekend. The Bulldogs defeated Evansville 9-4 in the Total Control Sports Invitational in Rosemont, Illinois, back on Feb. 9. First pitch from Cooper Stadium in Evansville, Indiana, is slated for 5 p.m. In its second nonconference game of the week, the softball team will return home to host the University of Illinois at Chicago. The Flames defeated the Bulldogs 3-2 in the Saluki Invitational back on March 8, and enter the week with a 10-14 record following a three-game sweep of Cleveland State over this past weekend. First pitch from the Butler softball field is slated for 4 p.m. and the game will be broadcast on the Butler Athletics Facebook page. The baseball team will have a quick turnaround from its game at Northern Kentucky as the Bulldogs return home to face Anderson on Wednesday afternoon. The Ravens are 8-5 to start the year, but have yet to play a true road game. Most recently, Anderson is coming off a 5-4 showing at the RussMatt Central Florida Invitational. Last year, the Bulldogs defeated the Ravens 13-4 in Indianapolis. First pitch for this year’s matchup is slated for 4 p.m. 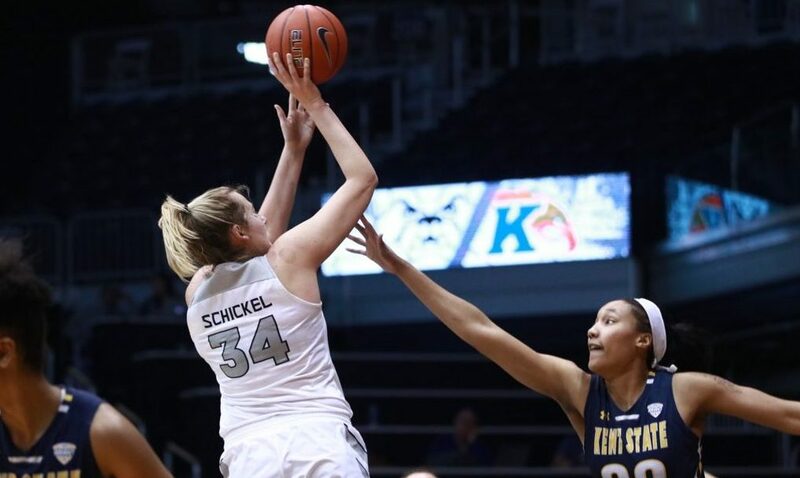 Following a convincing 70-52 win over Kent State in the second round of the WNIT, the Butler women’s basketball team will now travel southeast to play at Cincinnati in the third round of the tournament. The Bearcats enter the game with a 23-10 overall record following wins over Youngstown State and Minnesota in the first two rounds of the WNIT. Those victories marked the first time the team has won consecutive postseason games in program history. Cincinnati posted a 12-4 mark in the AAC this season but fell short of an NCAA Tournament appearance. First tip at Fifth Third Arena is slated for 7 p.m.
Over this past weekend, a number of athletes from the Butler men’s and women’s track teams set personal and school records. Among those setting personal bests were Jacob Uhl, Wade Walder, Rebecca Collester, and Kara Stark. The team will split up for the upcoming weekend, sending athletes to Stanford, California, and Raleigh, North Carolina, to compete in the Stanford Invitational and Raleigh Relays. At the Raleigh Relays last year, Johnny Leverenz won the 800 meters, while Allie Vogeler set a school record in the 400 meters. Competition at both events begins Friday and lasts into Saturday. On Friday, the baseball team will host Southern Illinois in just its second three-game home series of the season. The Salukis are coming off a 2-1 series win over Morehead State and are now 13-9 on the season. These two teams haven’t faced each other since 2008, when Southern Illinois swept a two-game series in Carbondale, Illinois. First pitch for this game is scheduled for 4 p.m. and the game will be broadcast on the Butler Athletics Facebook page. After a 4-3 loss to Valparaiso on March 23 gave the team its first loss in 11 matches, the Butler men’s tennis team will travel to Pennsylvania to play Villanova on Friday in its first conference match of the season. The Wildcats will enter with an 8-8 having lost six straight games. First serve for this match is slated for 6:30 p.m. The men’s and women’s track teams will wrap up competition at the Raleigh Relays and Stanford Invitational on Saturday. After more than a week off from competition, the Butler women’s tennis team will return to action on Saturday with a home match against Providence. The Bulldogs are coming off a 7-0 loss to Seton Hall on March 22, and looking for better results against the Friars, who enter the week with a 3-12 record following a 7-0 loss to Seton Hall on March 23. First serve from the Butler Bubble is slated for 11 a.m. Following its 19-2 loss to Vanderbilt on March 24, the Butler lacrosse team will welcome Georgetown to Indianapolis on Saturday for its first Big East contest of the season. Last year, the Bulldogs fell to the Hoyas 20-13, with Karina Latsko and Ashley Guerra scoring three and two goals, respectively, for Butler. The Hoyas enter the week with a 6-4 record following a 21-11 win against Cal Davis over this past weekend. This game is set to get underway in Indianapolis at 12 p.m. The softball team will return to Big East action when they host Villanova for a three-game series over the weekend. Last year, all three games between the two teams were cancelled. In 2017, the Bulldogs swept a three-game series against the Wildcats at home. Villanova went 1-2 against Seton Hall over the weekend to begin conference play, and enters the week with a 15-15 record. Saturday’s doubleheader will get underway at the Butler softball field at 12 p.m. The baseball team will continue its three-game series against Southern Illinois with a 2 p.m. game at Bulldog Park airing on the Butler Athletics Facebook page. Following its Friday contest at Villanova, the men’s tennis team will travel north to New York to take on St. John’s. It will be the first conference match for the Red Storm, who will enter with an 9-5 record following a win over Yale on March 24. First serve from Cunningham Park in Queens, New York, is slated for 4 p.m.
After facing Providence on Saturday, the women’s tennis team will welcome Marquette to campus for a match on Sunday. The Golden Eagles enter the week with a 8-8 following a 4-3 loss to Xavier over this past weekend. Marquette defeated Butler 7-0 last year in Milwaukee. First serve from the Butler Bubble is scheduled for 12 p.m. The softball team will wrap up its three-game home series against Villanova with a 12 p.m. game Sunday at the Butler softball field, streaming on the Butler Athletics Facebook page. The baseball team will wrap up its three-game series against Southern Illinois with a 1 p.m. game at Bulldog Park.